The last of four ships to bear the name HMS Vernon was a fourth rate 50-gun 'Symondite' frigate launched at Woolwich on May Day in 1832. 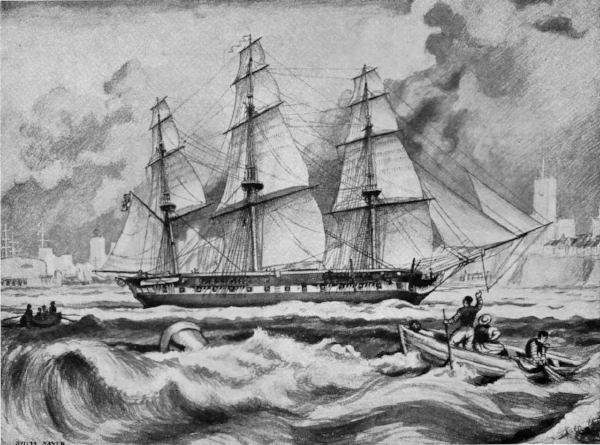 She saw active service in home waters, the Americas and the East Indies between 1832 and 1848. 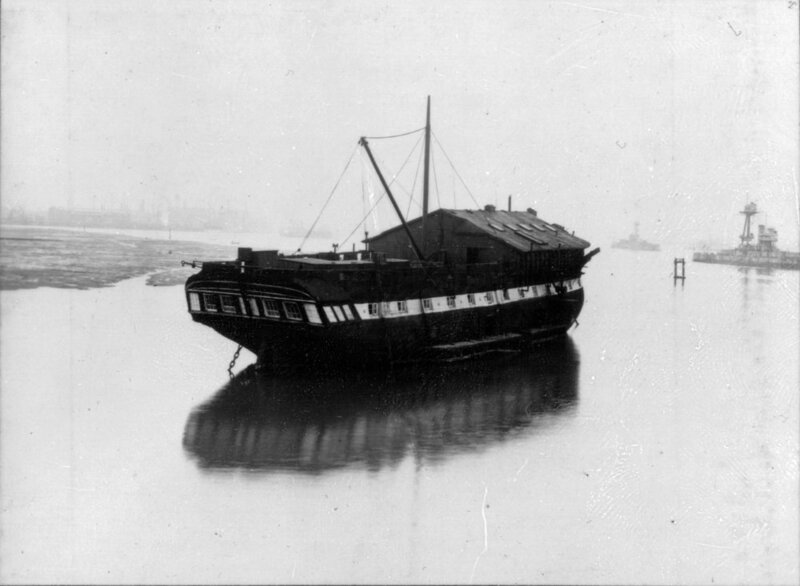 She was then laid up in Chatham Dockyard until emerging in 1867 for use as a floating coaling jetty. This ship was actually named after the Hon George Vernon, a friend of Capt William Symonds who had designed her, but her name became synonymous with one of his ancestors, Admiral Edward Vernon (1684-1757) nicknamed 'Old Grog'. On 22 Nov 1739, he achieved fame by commanding a squadron of six ships which captured the Central American coastal fortress of Portobello from the Spanish. Although he suffered a later defeat at Cartagena, he was elected to Parliament on the basis of his previous success. He was known as ‘Old Grog,’ reputedly because of his penchant for wearing a cloak made of grogram (from the French ‘gros grain’), a coarse fabric of silk or mohair and wool. In 1740, he had the sailors’ neat rum ration diluted with water, a mixture known ever afterwards as ‘grog. Successive HMS VERNONs adopted the same motto as the town of Vernon-sur-Seine in France where the Vernon family had originated: "Vernon Semper Viret". The literal translation of this is "Vernon Forever Green" but a more realistic translation would be "Vernon Will Always Flourish". HMS VERNON, the floating Torpedo & Mining School, was first commissioned as an independent command in Fountain Lake, Portsmouth on 26 April 1876. The collection of hulks, newly independent of HMS EXCELLENT (the Gunnery School), originally comprised the fourth rate 50-gun 'Symondite' frigate Vernon together with the former 26-gun screw frigate Ariadne (providing accommodation) and the lighter Florence Nightingale. It was from the Torpedo & Mining School that the Mine Warfare and Clearance Diving branches eventually evolved. From 1874 to 1923, Vesuvius, a gunboat of 250 tons, became Vernon's Whitehead Experimental Tender for the conduct of torpedo trials. The hulk of the fourth rate frigate Actaeon was added in October 1879 and used as a workshop. In January 1886 the former two-deck ship-of-the-line Donegal arrived and assumed the original Vernon's role as a more spacious torpedo school ship. Donegal was renamed Vernon (VERNON I). The original Vernon was renamed Actaeon (VERNON IV) and replaced the original Actaeon as a practical workshop. 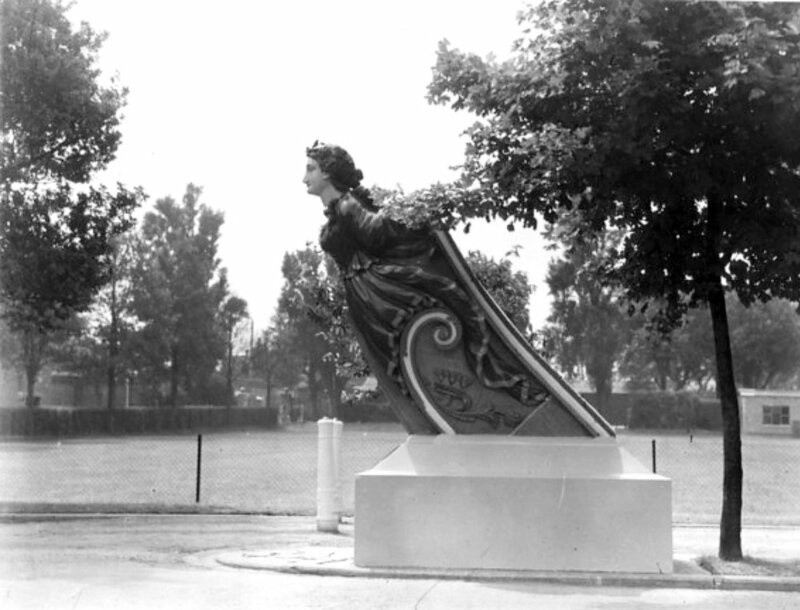 The original Actaeon was then scrapped. 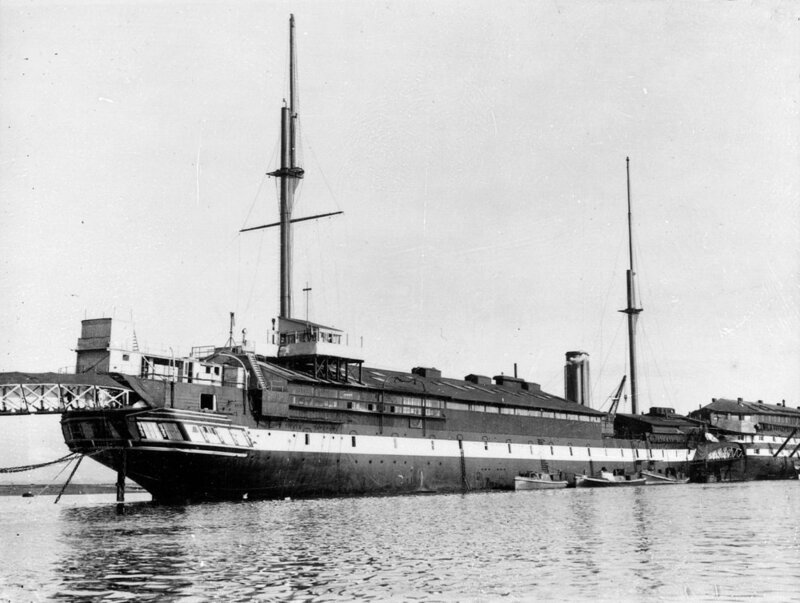 On 23 April 1895, the hulks of Vernon (formerly Donegal), Ariadne and Actaeon (the original Vernon) were moved from Fountain Lake to Portchester Creek in Portsmouth Harbour. 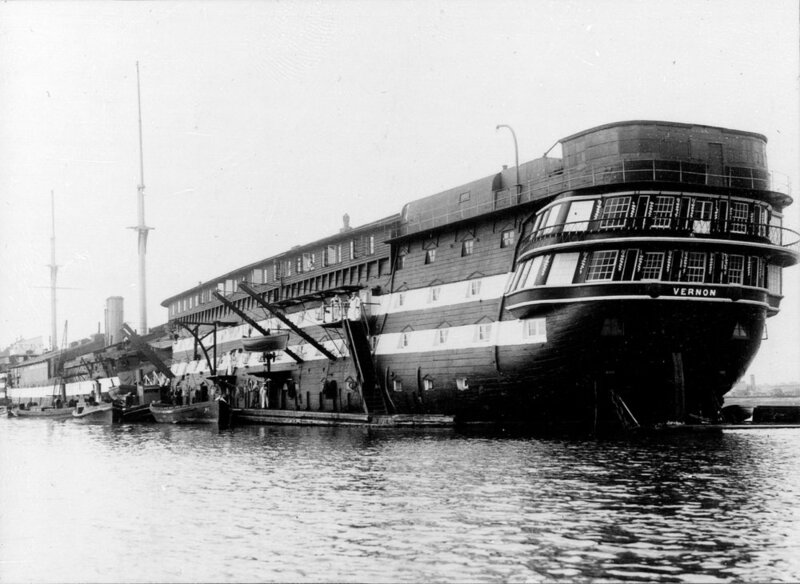 In 1903, the accommodation hulk Ariadne was replaced as VERNON II by the hulk of the old 121-gun three-decker Marlborough. 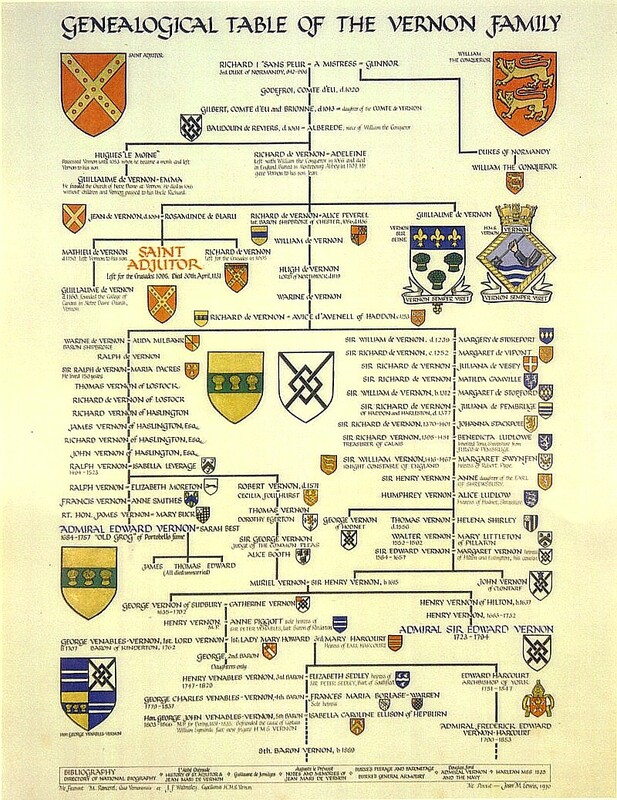 Marlborough was connected by bridges to Actaeon (VERNON IV) and the old Donegal, now called Vernon (VERNON I). 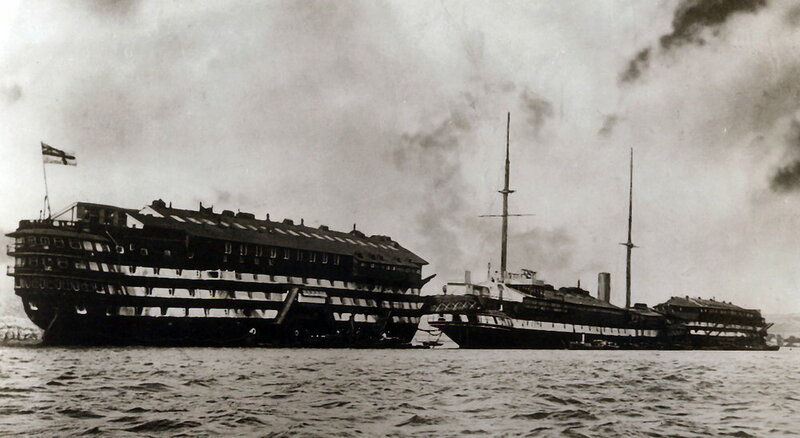 In 1904 the pioneer ironclad Warrior (now the museum ship 'HMS Warrior 1860' in Portsmouth) arrived as a floating workshop, power plant and wireless telegraphy school and became VERNON III. For conformity, Actaeon (the original Vernon) became VERNON IV. 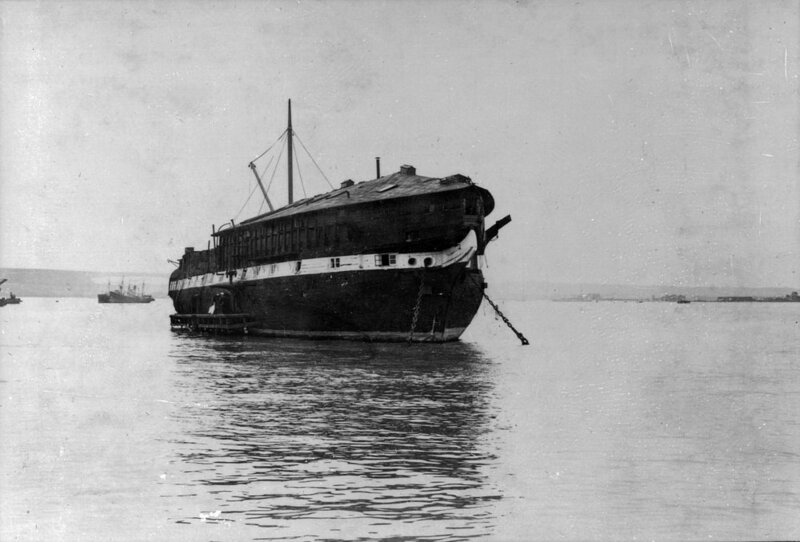 She was moored separately abreast Marlborough (VERNON II), on the other side of Portchester Creek, and was used as an instructional ship and floating workshop. In 1904, Ariadne (ex-VERNON II) was sent to Sheerness where, confusingly, she was renamed Actaeon on 6 June 1905 or 1906 (depending on source) and became the nucleus of a new torpedo school. She was eventually sold on 11 December 1922. This is Actaeon, the former Ariadne (VERNON II), as painted by Eric Ravilious in 1942 (Cdr Harold West DSC* RN). In 1916, the second class cruiser Forte was moored alongside Warrior (VERNON III) for use as offices and extra living accommodation. Between 1916 and 1923, various submarines and a barrage vessel were attached to the School to assist in providing electrical power. During the First World War, work at HMS VERNON concentrated on torpedo trials and training and the research and development of anti-submarine devices and training in their use as well as mines and ships' electrics. 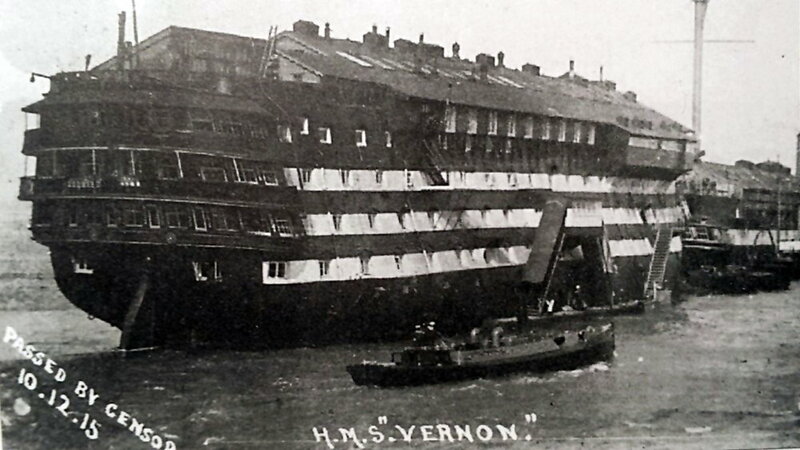 On 1 October 1923, HMS VERNON (or ‘The Vernon’ as it came to be known) was established ashore at Portsmouth on the site of the old Gunwharf (now the development known as Gunwharf Quays) and Mining, Whitehead [Torpedo] and Electrical departments were formed. The original 50-gun 'Symondite' frigate Vernon, since called Actaeon (VERNON IV), was sold and towed to Castle's shipbreaking Yard at Woolwich to be scrapped. Similarly Marlborough (VERNON II) was sold for scrap in October 1924 but capsized off Osea Island in the Blackwater estuary on 28 November 1924 while being towed to the shipbreakers. Donegal (VERNON I) was sold on 18 May 1925 to Pounds shipbreakers in Portsmouth. The original names of the Vernon hulks were adopted for buildings in the shore base. During the Second World War, HMS VERNON remained responsible for mine disposal and mine countermeasures. Her officers and scientific staff achieved several coups involving the capture of mines and the development of countermeasures. 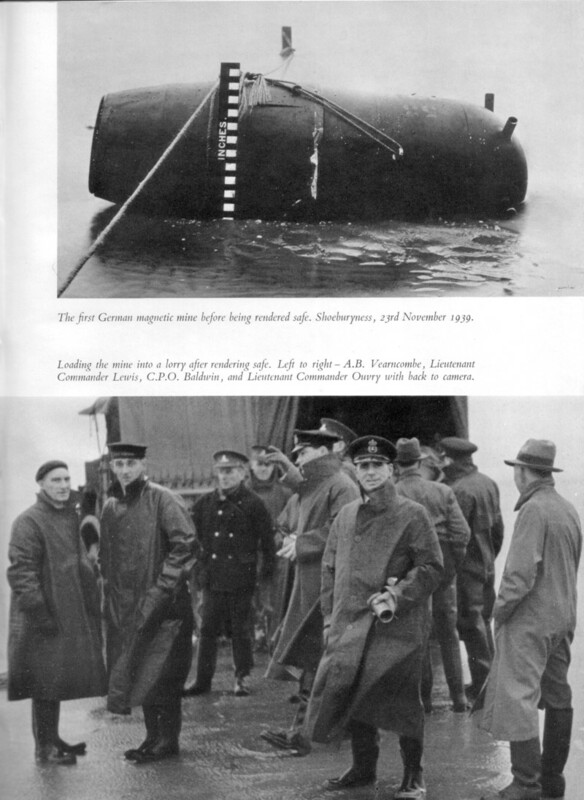 The earliest of these was the rendering safe and recovery of the first German magnetic mine (Type GA) at Shoeburyness on 23 November 1939. For this deed, Lt Cdr (later Cdr) John Ouvry was decorated with the DSO by King George VI at a ceremony on HMS VERNON's parade ground on 19 December 1939. Others decorated at the same time for this, and other tasks where mines were rendered safe for recovery and examination, were Lt Cdr Roger Lewis (DSO), Lt J E M Glenny (DSC), CPO C E Baldwin (DSM) and AB A L Vearncombe (DSM). Of particular note, these were the first Royal Navy decorations of the war. Ouvry's feat enabled the boffins at HMS VERNON to develop effective mine sweeping and ship protection systems including degaussing, wiping and deperming. Churchill, then First Lord of the Admiralty before his re-appointment as Prime Minister, visited HMS VERNON in September 1939 and again in January 1940. 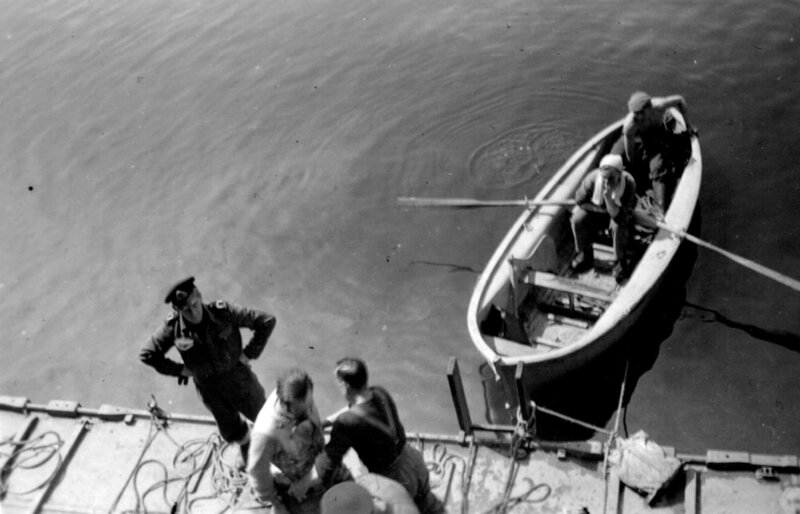 In June 1940, the first attempt to render safe a ground mine by divers was made in Poole Harbour, Dorset. 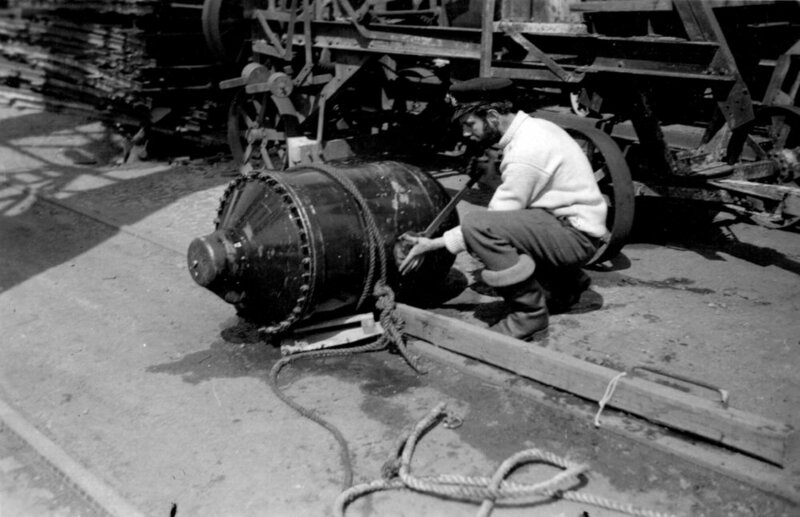 A diving unit from HMS EXCELLENT, supported by divers trained in Rendering Mines Safe (RMS) techniques from HMS VERNON, successfully removed the fuze from a Type GC mine underwater although the mine exploded as it was towed inshore. 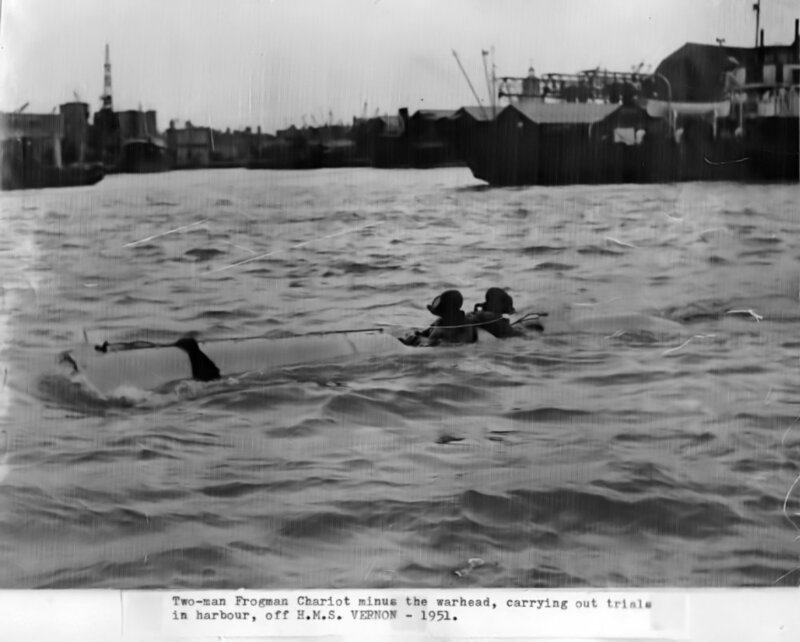 For his central role in this task, Able Seaman Diver R G Tawn was subsequently awarded the DSM. On discovering the skill of HMS VERNON’s mine technicians, the Germans placed booby traps in some mines. 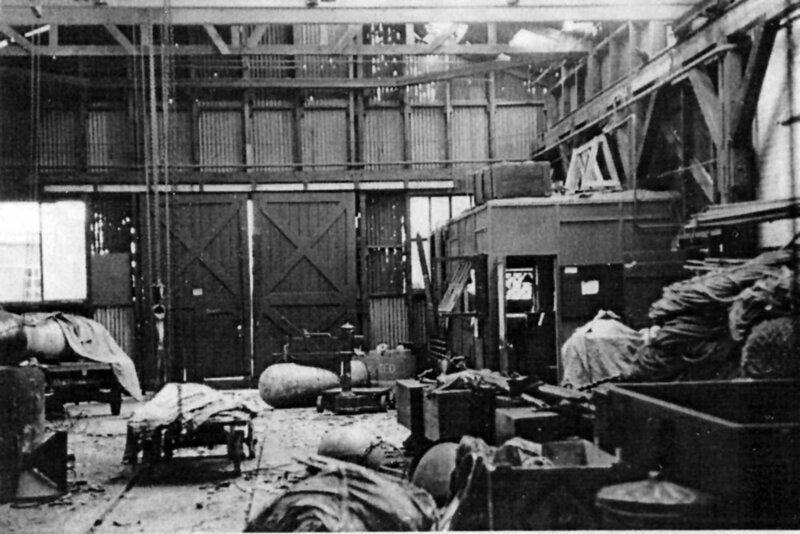 One was fitted with a small explosive charge that detonated when the mine was stripped in the mining shed at HMS VERNON on 6 August 1940 causing the deaths of Commissioned Gunner (T) Reginald A. Cook, PO Cecil H. Fletcher, AB William B. Croake, AB William J. Stearns and AB Alfred E. Stevens and serious injuries to other personnel. 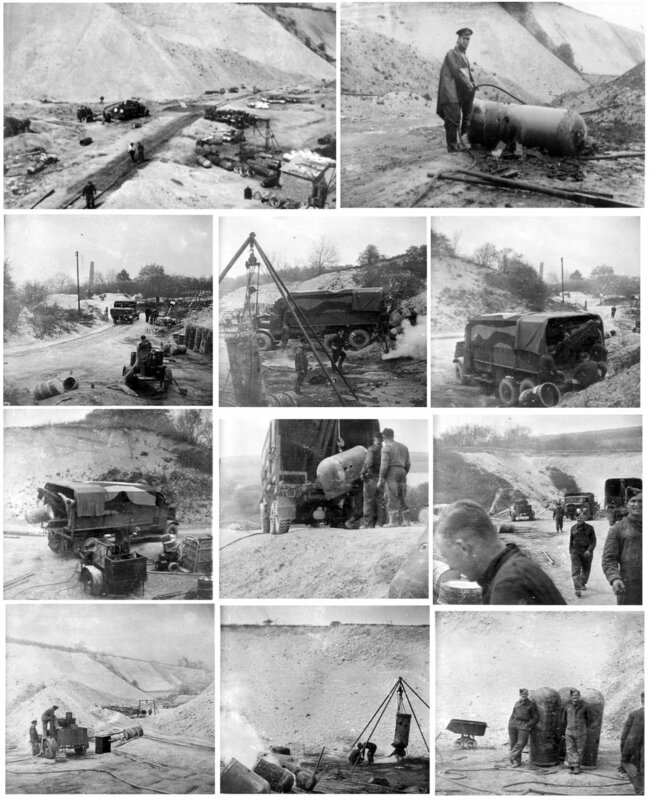 Following this incident, mines were stripped and examined at a disused limestone quarry at Buriton near Petersfield that was nick-named 'HMS Mirtle' (short for Mine Investigation Range). 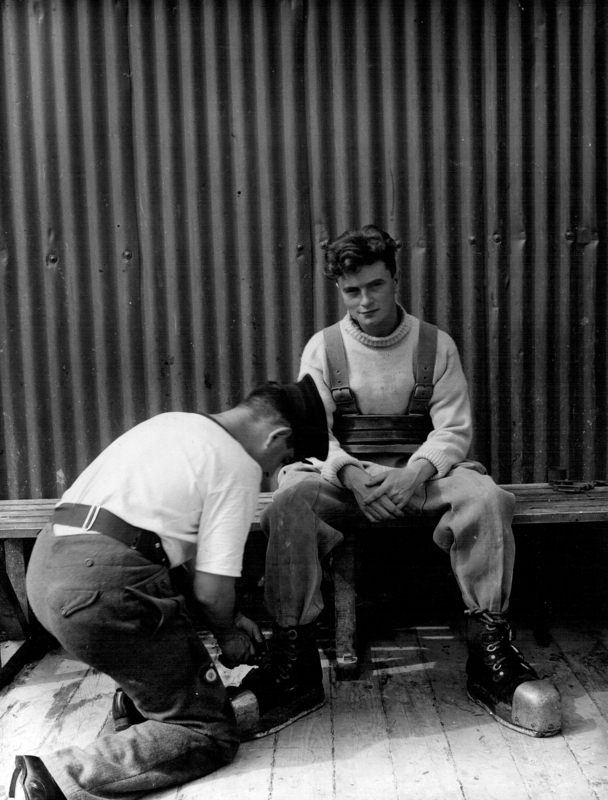 VERNON-trained naval bomb & mine disposal personnel, including several highly decorated Royal Australian Naval Reserve officers and American volunteers, whose work took them across the country during the Blitz and far beyond the nation's shores. They were awarded as many George Crosses, George Medals and other honours and decorations for their gallant achievements as the other two services combined. Various sections of HMS VERNON were dispersed to sites throughout the country following heavy air raids on Portsmouth, one of which demolished Dido Building and killed 100 people in a single night. 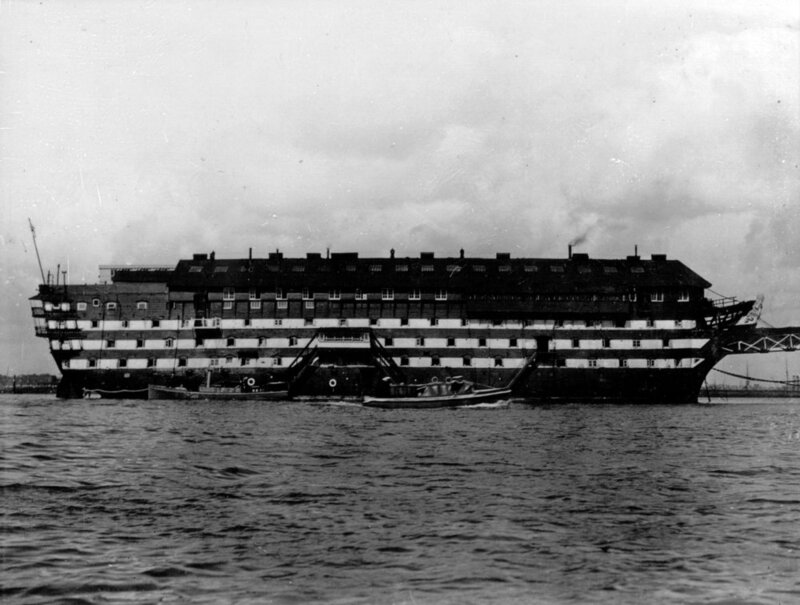 On 3 May 1941, the main part of HMS VERNON was evacuated to Roedean Girls’ School at Brighton (VERNON(R)) where bell pushes on the dormitory bulkhead were purportedly labelled ‘Ring for Mistress”. Other sites included Havant, Purbrook, West Leigh (VERNON(M)), Stokes Bay, Hove, Dartmouth/Brixham, Helensburgh, Edinburgh and Port Edgar. 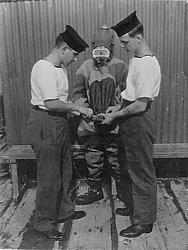 Although many naval divers were trained at HMS VERNON in Rendering Mines Safe (RMS) procedures as members of the Mine Recovery Section during the Second World War, it was not until 1 October 1944 that responsibility for naval diving passed from the Gunnery Branch, still based at HMS EXCELLENT, to the Torpedo Branch based at HMS VERNON. This brought Mine Warfare (both mining and mine countermeasures) and Diving under the same organisation for the first time. Owing to the wartime evacuation measures, a new diving school and experimental station known as VERNON(D) was set up at Brixham in Devon on 27 Oct 1944. The (D) referred to Dartmouth where administrative support was stationed. 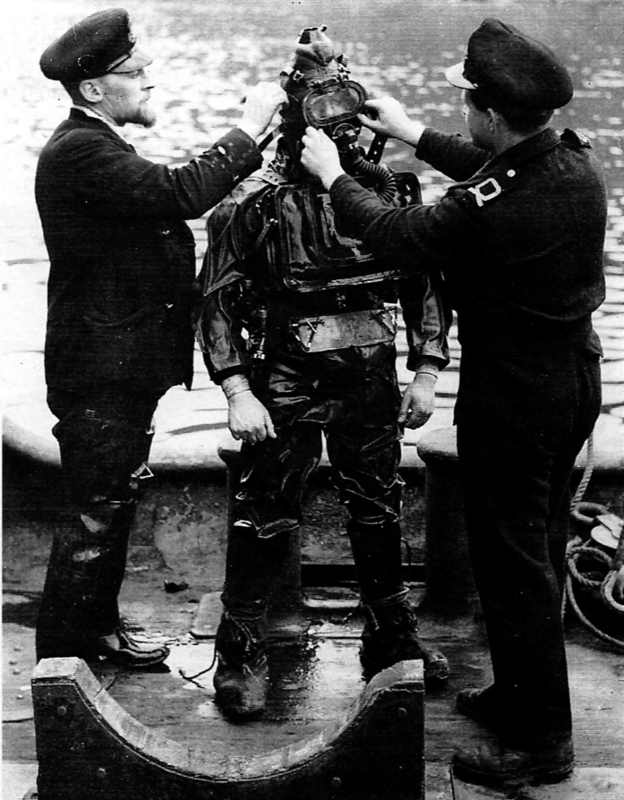 The Royal Navy's Superintendent of Diving, responsible since 1942 for the Admiralty Experimental Diving Unit (AEDU) based at Siebe Gorman and Co, Tolworth, Surrey and for the coordination of diving training in addition to research and development, moved to Brixham together with HMS Tedworth, the RN Deep Diving Tender. 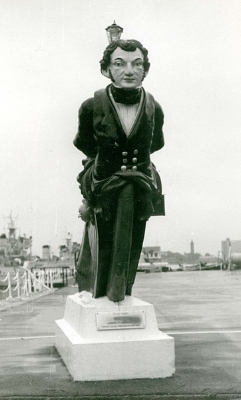 Almost immediately, VERNON(D) became overwhelmingly occupied with the training and support of ‘P’ (Port Clearance) Parties (Naval Parties 1571-1575 and 3006) until 1 October 1945 when the organisation moved back to HMS VERNON proper at Portsmouth. On 10 October 1946, the Torpedo Branch divested its Electrical responsibilities to the recently formed Electrical Branch and merged with the Anti-Submarine Branch (formerly based at HMS OSPREY at Portland) to form the Torpedo and Anti-Submarine (TAS) Branch. 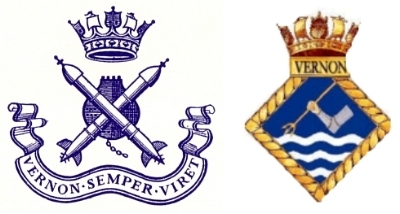 Hence, the TAS Branch assumed responsibility for naval diving and HMS VERNON adopted a new badge to reflect the change. .
As the Royal Navy’s alma mater of mine warfare and diving, HMS VERNON was responsible for the Admiralty Experimental Diving Unit (AEDU) and saw the development of clearance diving which had originated with the ‘P’ Parties clearing European ports and their approaches of German ordnance and booby traps after D-Day in World War II. 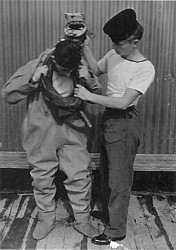 Until circa 2000, there were two types of diver in the RN. A Ship’s Diver (formerly the Shallow Water Diver) could be of any rank or specialisation and was trained to use self-contained open-circuit compressed air diving apparatus to search the ship’s bottom for explosive devices or perform simple underwater engineering tasks. 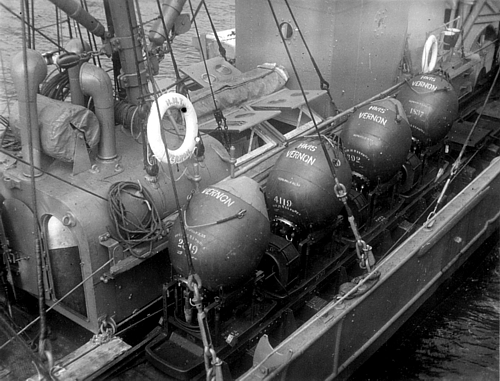 The more advanced Clearance Diver (CD) was a specialist trained in the use of all types of service diving equipment including surface demand and closed-circuit mixture breathing apparatus to perform deeper diving, EOR (Explosive Ordnance Reconnaissance), EOD (Explosive Ordnance Disposal otherwise known as bomb & mine disposal), IEDD (Improvised Explosive Device Disposal), salvage operations and complex underwater engineering tasks. Today, only the Clearance Diver remains. The former German torpedo trials ship and seaplane carrier Walter Holtzapfel, a war-prize, was first commissioned into the Royal Navy as the deep diving tender HMS Deepwater. However, she was hopelessly inadequate for the demanding role expected of her because she was fitted with elderly diving equipment from her wartime predecessor HMS Tedworth, a converted WW I coal-burning Hunt class minesweeper known as a ‘Smokey Joe’. Deepwater was subsequently berthed on Maintenance Jetty at HMS VERNON and used as a floating diving school. VERNON-based divers in HMS Reclaim, another of Tedworth's successors, established world records for deep diving during the 1950s and 1960s. Much of the initial diving training was conducted in Horsea Lake on Horsea Island, just to the north of Portsmouth. The 8 metre-deep lake was originally constructed as a torpedo range and had been extended in length from 600 metres to 1 km. Royal Navy and Army diving training is still conducted on Horsea Island at the Defence Diving School (DDS). Warfare Branch ratings and warrant officers of the Royal Navy’s CD Sub-Branch (formed in 1952) complement those of the Mine Warfare (MW) Sub-Branch (formed in 1975) while their officers, also members of the RN Warfare Branch, are usually trained in both disciplines as MCDOs (Mine Warfare & Clearance Diving Officers), whose sub-branch was formed in 1966, able to turn their hand to minefield planning, minelaying, mine countermeasures (mine hunting using sonar as well as mine sweeping), diving, demolitions and EOD/IEDD. HMS VERNON remained the home of the TAS Branch at Portsmouth until the Summer of 1974 when it was devolved to HMS DRYAD at nearby Southwick prior to the formation of the Operations Branch in early 1975. HMS VERNON was also where mines and mine disposal techniques and equipment were developed and minesweepers, mine hunters, minelayers and clearance diving teams were based. Post-war operations saw their involvement in Konfrontasi (the Indonesian Confrontation) in the 1960s, the clearance of the Suez Canal in 1956 and again in 1974, the Red Sea in 1975, the Falklands in 1982, the Iran/Iraq Tanker War in 1986 and the first and second Gulf wars in 1991 and 2003. MCMVs and Clearance Diving teams are still kept busy on and around UK shores and mine hunters are permanently stationed in the Persian Gulf as well as serving with NATO forces in northern Europe and the Mediterranean. The Vernon Monument will celebrate all those involved in training, manning and supporting these ships and units - past, present and future. Training in Diving, Demolitions and Minewarfare, along with Naval Control of Shipping and, for a time, Seamanship, continued on the site of HMS VERNON at Portsmouth even after it ceased to be an independent command on 31 March 1986 and was renamed HMS NELSON (Vernon Site). In 1987, the establishment was renamed HMS NELSON (Gunwharf) and briefly became Headquarters for the Commandant General Royal Marines before his move to permanent accommodation at HMS EXCELLENT on Whale Island. In November 1995, Minewarfare training was shifted to the School of Maritime Operations (SMOPS) HMS DRYAD at nearby Southwick and subsequently to the Minewarfare Operational Training Centre at the Maritime Warfare School in HMS COLLINGWOOD across the harbour from Portsmouth. Diving training, together with the Superintendent of Diving, the Fleet Diving Headquarters, the Fleet Clearance Diving Team and the Portsmouth Area Clearance Diving Team moved into new accommodation on Horsea Island in Portsmouth Harbour and the old VERNON establishment closed its gates for the last time on 1 April 1996.